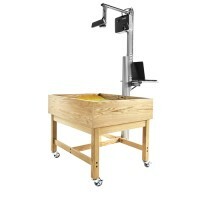 These Mobile Science Lab Demo Units feature your choice of heat-, scratch-, and chemical-resistant countertops with or without sink and fixtures on sturdy oak bases that roll around your science classroom on swivel casters that brake for safety. The oak bases also feature plentiful storage space in the form of shelves, locking cabinets, and drawers to securely store lab equipment and supplies. 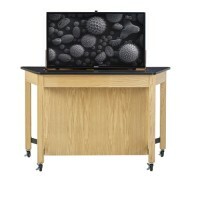 Add a Mobile Science Table Unit to your lab or classroom and give yourself quick, easy access to all your class and experiment needs anytime, anywhere.